Battle Packman 2 Terminator is a mad 3D shooter. Battle Packman 2 Terminator is a mad 3D shooter. You mission is simple - just try to survive. Tons of enemies will try to eat you. Do you want to feel the power of an auto cannon? This is just what you want. 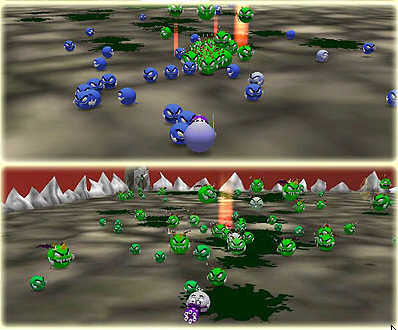 Shoot all attacking enemies and pick up the ammunition you see. Zombies - you need to kill as many as possible of them. Zombies are green, slow and stupid creatures. But they can surround you and eat you! You are very tasty for them. 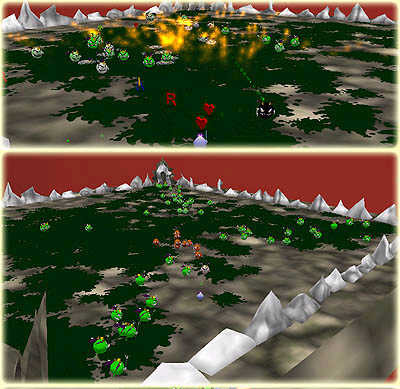 Survive - try to survive for some short time, enemies can improve, their power can grow level by level. You begin with an improved auto cannon. But in this game you will not receive any items. Crusade - this game has a scenario. The army of hell will try to kill you. You must walk through them and kill a violet boss. You will see ninjas, golems, ghosts, musketeers and their bosses. Talk 2Desktop - Enables you to control your PC using your own voice! Warkanoid - Enjoy the challenging levels of block-breaking mayhem ! XOP Plus Game - " The most realistic brick-breaker around. " Z-Ball Gold - Z Ball Gold is just what you need, a super Z Ball Game for you! HOLIDAY FUN FOR KIDS - 15 fun games and holiday games for kids all in one! IncrediBubble - Guide Phlipper through an amazing underwater puzzle world. Jr. Vet Game - You are an animal doctor traveling through the animal hospital and must cure all the sick animals. Super SpongeBob SquarePants Collapse - Our latest super SpongeBob SquarePants Collapse game offers you the best of both! MyABCD - My ABC is an animated ABC Kid Learning Game. Eagleslots: Western Wins - A 5 reel, 20 payline slot machine game with a Wild West theme! Eagleslots: Leprechaun Loot - A 5 reel, 20 payline slot machine game with a Leprechaun and Irish theme! Eagleslots: Witchy Wins - A 5 reel, 20 payline slot machine game with a Halloween theme! Eagleslots: Pyramid Pays - A 5 reel, 20 payline slot machine game with an Egyptian theme. Eagleslots: Year of the Slots - A 5 reel, 20 payline slot machine game!